Once reserved only for royalty, the scenic canals of France now welcome travelers seeking intimate encounters with rural life. 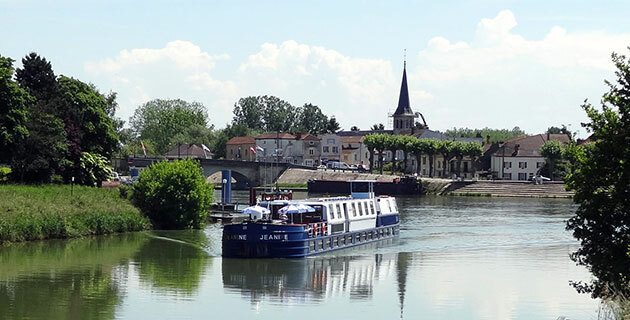 Aboard a privately chartered barge, we savor fine French food and wine, and new friends as we leisurely ply the waterways of the Rhone-Rhine and Burgundy canals. Combined with stays in Lyon and Paris, this tour embraces the good life, French style. Please call if your city is not listed or for land only prices. Prices are per person based on double occupancy in an outside cabin and include airline taxes, surcharges, and fees of $502, which are subject to change until final payment has been made. Single travelers please add $2,995. Your $375 deposit is fully refundable up to 155 days prior to departure. All 2020 tour prices above (excluding airline taxes, surcharges, and fees) are guaranteed. The Hotel Carlton Lyon sits in the heart of Lyon’s Presqu’île, the city’s bustling central peninsula set between the Rhône and Saône Rivers. This trendy district contains a multitude of cafes, restaurants, shops, and museums, and offers the perfect base from which to explore the city of Lyon. Housed in a lovely cream-colored stone building with wrought-iron railings, the hotel is decorated with upscale, red-accented furnishings and offers a luxe cocktail bar and lounge, bicycles for rent, spa with massage service (for a fee), and complimentary Wi-Fi internet access. Air-conditioned guest rooms have private bath with hair dryer, tea- and coffee-making facilities, minibar, in-room safe, TV, and phone. The 126-foot MS Jeanine provides a leisurely private cruising experience along the impossibly charming canals of Burgundy. The barge’s bright blue and white exterior trim give way to a contemporary interior featuring a cozy lounge/bar and a restaurant with panoramic windows (both of which serve complimentary beer and wine throughout the cruise). The Jeanine also offers two open-air spaces to relax and take in the scenery: the sun deck, running along the top of the barge and offering loungers and parasols; and the barbecue deck, an open space at the bow with tables and chairs for enjoying a snack or drink. Other amenities of the barge include an outdoor Jacuzzi, 12 complimentary bicycles available to cycle alongside the canals, and complimentary Wi-Fi internet access. Each of the 11 air-conditioned cabins is 97 square feet and includes an above-waterline window and private en-suite full bathroom with stand-up shower. Due to the nature of barge travel, ships are built in a compact manner to navigate narrow canals and low bridges. As such, ceilings on both decks of the barge are approximately two meters (6 feet, 7 inches) in height. There is also limited storage space inside cabins, and luggage will be stored underneath the beds, which have a maximum clearance of 15 ¾ inches. Named for its most famous frequent guest, King Edward VII of the United Kingdom, the Hotel Edouard VII sits in the heart of Paris. The hotel is located in Paris’s Opera district, just two blocks from the Opera Garnier and less than 10 minutes’ walk from two famed department stores: Printemps and Galeries Lafayette. In keeping with its location, the hotel offers a classically elegant atmosphere that includes a restaurant, bar, fitness center, and Wi-Fi internet access. After undergoing a recent renovation, the Hotel Edouard VII now reflects the sensibilities of the fashionable king for which it was named, as each guest room is outfitted with rich fabrics and designed around an individual color scheme. The guest rooms are air-conditioned and offer private bath with hair dryer, minibar, in-room safe, TV, and phone. See more of this wondrous city on your own, at your own pace. An author with over thirty years’ experience living on, restoring, and sailing boats all around the world tells the tale of life aboard an authentic Burgundy canal barge. Bookseller Monsieur Perdu believes that books can cure all of life’s afflictions, but when he is left heartbroken, he sets out from his shop in Paris to make peace with his past, dispensing wisdom (and more books) along the way. A love letter to the written word, this internationally renowned novel has been translated into over 28 languages. Despite its modest size, Burgundy is well known as one of the world’s finest wine-producing regions. In this highly visual volume containing maps, illustrations, and over 150 photographs, readers take a journey into Burgundy’s vineyards and wine cellars. American Ray Walker had a successful career in finance when he took a wine-tasting vacation in France’s Burgundy region. This vacation ignited a passion, and Walker quit his job and moved to France to open a vineyard despite having no winemaking experience and only a limited grasp of French. His story highlights the inherent joy in following one’s true passion, no matter what the perceived challenges.